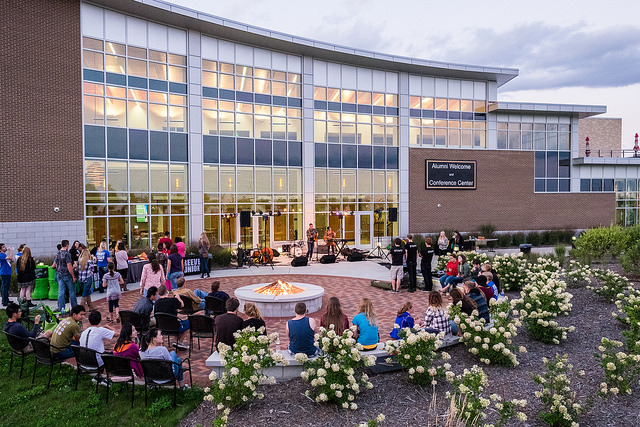 The University of Wisconsin Oshkosh Alumni Association serves alumni by representing, informing and providing opportunities for involvement to meet their interests and to support the University’s evolving mission and tradition. In April 2014, the Alumni Relations offices moved from the Pollock Alumni House on Algoma Boulevard to the Alumni Welcome and Conference Center at 625 Pearl Ave.
1871 The Oshkosh Normal School opened. 1901 The first recorded minutes of an Alumni Association meeting with temporary officers dates back to June 20, 1901. 1910 The association began issuing an Alumni Bulletin, which sparked the need to accumulate more precise information about the whereabouts and occupations of graduates. 1914 to 1915 Alumni held a fundraiser to build the school’s first union or “student building.” However, during WWI, the plan was denied and the funds were used to purchase war bonds for the school. 1920 The Alumni Association begins an organized drive to replenish school archives of publications and records lost in the fire of 1916. Alumni nationwide responded to the plea. 1921 First campus Homecoming celebrated. 1947 UW Oshkosh purchased the Pollock House. The building was first used as women’s housing, then as the headquarters of the newly established School of Nursing. 1963 The Alumni Association took an active part in organizing the University Foundation. An Alumni Award also was presented at spring commencement. 1971 Pollock House became the Alumni Association’s new home. 1980 First Alumni phone-a-thon conducted. 1995 College of Business Alumni Association formed. 1999 First alumni directory printed, including more than 50,000 alumni. 2002 The Alumni Association became “dues-free” and welcomed all alumni and members to join. 2004 Second alumni directory printed. 2005 First electronic newsletter emailed to more than 20,000 alumni. 2007 Alumni numbers increased to more than 70,000. 2008 Homecoming 2008 drew a record attendance. 2009 Golden Titans took part in spring commencement ceremony for the first time. The third alumni directory published. 2011 Alumni Relations sponsored a Titan Nutcracker, created by alumna Stacey Cluppert ’10, as part of Oshkosh’s “Nutcrackers on the Town” campaign. 2012 Alumni shared their favorite campus experiences and photographs in the UWO Memories Project in conjunction with Homecoming 2012: Titan Throwback. 2013 The Alumni TitanCard was introduced to provide special benefits to UW Oshkosh graduates. 2014 In April, Alumni Relations moved from Pollock House to the Alumni Welcome and Conference Center at the corner of Wisconsin and Pearl.